This afternoon was our first of many fieldtrip options we have during OCEANDOTCOM. The options for today were to go aboard the R/V Acadaina for a tour of some habitats with trawling and bottom sample grabs, or to tour the salt marshes and explore restoration efforts. 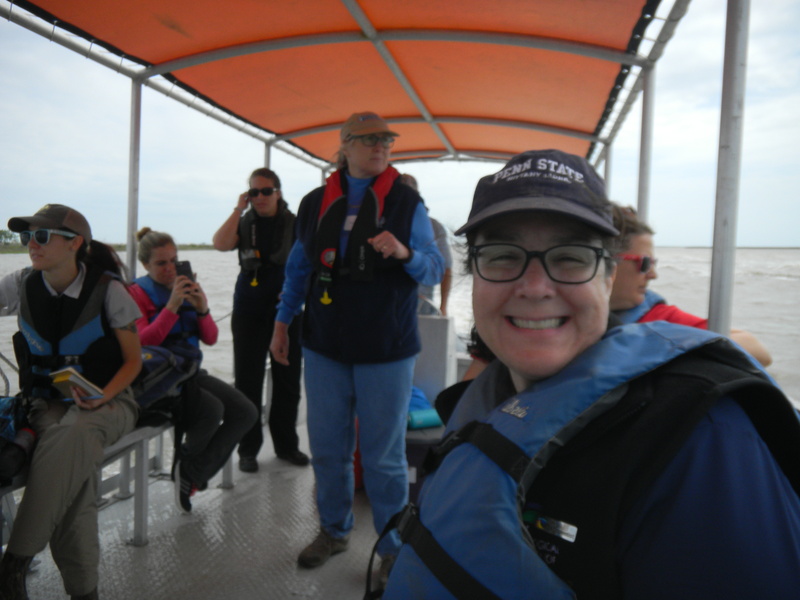 I decided to attend the salt marsh trip with Dr. Denise Reed, who spoke to our group this morning. 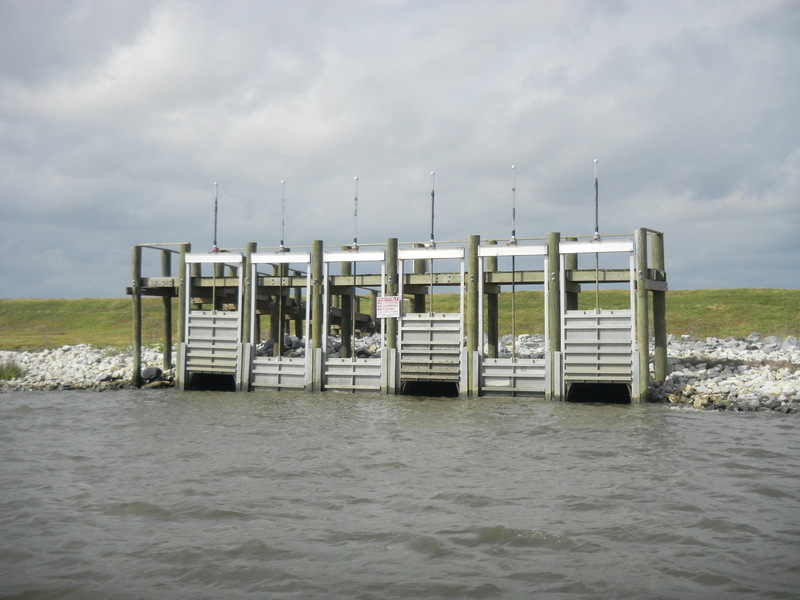 We headed out on three different boats (I was on the pontoon boat) and explored areas of the salt marsh. We stopped at several locations to explore the vegetation (grasses, trees) and take cores of the marsh (mainly layers of mud and plant roots). I appreciated Dr. Reed’s stories as we traveled, especially the story of the oak trees. She shared that oaks were much more abundant in this area, when the water levels were lower. Now, that water levels are rising, the root systems of the oak trees are getting too wet. They are “unhappy” and are dying. These are some images of the boats, Dr. Reed, and the dead oaks. It was also interesting to hear Dr. Reed speak about large objects found abandoned in the marsh. For example, this boat probably washed in from a major storm that came through. 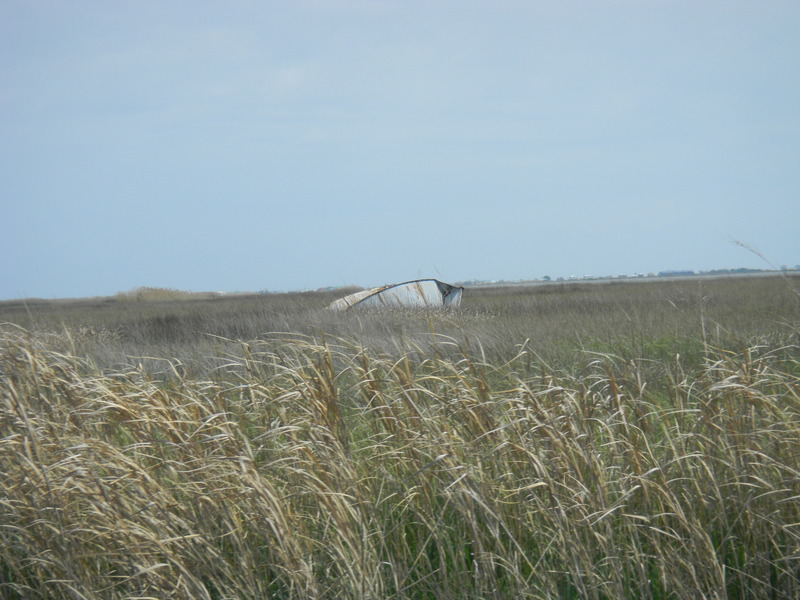 Because it would cause more environmental damage to the marsh to remove the boat than to leave it there, the boat is left to sit on the marsh grasses. My favorite spot and stop of the day was our first location – orginially, this was completely under water. But now, this area is becoming stabilized by dredged material and plant growth. This ground sunk slightly under our feet as we walked around. You can still see the tire tracks of the tractors as this material was pushed around. Around the edge is a rim of material higher in elevation. In the video clip below, Dr. Reed discusses the trade-offs of quickly establishing a marsh vs. having an area where fish can inhabit. (*I apologize for the sound of the wind – but thankful for the wind, as it kept the mosquitos away!). Oh, and did I mention the mudcracks??? This was so cool – my first undergraduate research project was in my Junior year of college. I was in a Microbial Geology course, and I looked at the mathematical representation of the cracking of mud. I took lots and lots of photos of mudcracks, using a marker for scale in the image. At that time, cameras used film, and I took an entire roll of film to the drug store to get processed. When I picked up the print photos, the cashier said, “boy, you really do love your Sharpie.” Clearly, he didn’t realize how fascinating mudcracks can be. And today, when I was taking mudcrack photos, someone asked me why I was taking photos of a Sharpie! But check out these images, and how amazing it is to see the plants pushing the mud out of the way to grow and stabilize the substrate. One final favorite part of the fieldtrip I’ll share was seeing this unique type of levee – Dr. Reed referred to it as an “open levee” that allows water and fish to flow through the levee. The access and flow is completely controlled by humans. See. Dr. Reed explain this part of the levee system. We made it back to the field station for dinner (I had quite the amount of mud covering my feet – and we weren’t able to wear our muddy shoes in the dorm!). Tomorrow – more fieldtrips, and a dinner with two Tribal groups. The natural and cultural piece tomorrow will certainly be a highlight of this weekend!